A rewarding future awaits you. The economies across the globe are rapidly metamorphosing into a mega economy. In the present era strategic alliances, joint ventures, unpredictable market conditions, cross-cultural capabilities and visionary leadership are the challenges of corporate arena. A prerequisite of leadership is to look beyond the present. Foresighted vision, sense of mission & passion are required to achieve the noble objectives. 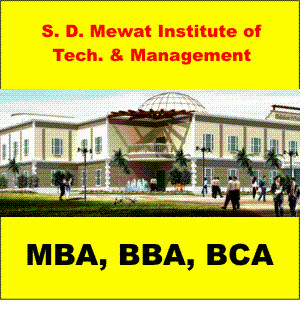 S. D. Mewat Institute of Technology & Management, is committed to develop competent human resource in the field of Education with innovative caliber to meet global challenges fulminating in strong socio-economic condition of general public across the globe. Best wishes to you all.